Ben is the co-founder of B&A. As Director of Sales for Dorman Cheese Co. Ben propelled the company to national prominence. He then became Vice President of Sales at Polly-O-Dairy but received his training as a young man as Head of Distribution for Sealtest Foods (a division of Kraft). With over 55 years of experience comes a complete understanding of the retail food industry. That experience coupled with Ben’s key business relationships, provided his principals with the tools needed to break into the NY market and achieve their sales goals. Joined by his son Andrew a year after starting the company, B&A soon became the “go to broker” for manufacturers and distributors looking for an entrepreneurial sales organization that would not take no for an answer. 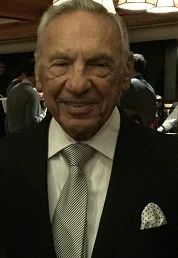 Ben's accomplishments were best expressed by King's Supermarkets' Ron Kamin when King's honored B&A as its year 2000 dairy partner of the year. Ron said, "the legendary Ben Epstein has been in the food business long enough to share war stories that we only read about in books. After turning over the business to his son, he has had the fortunate experience of seeing him take over the way he used to dream it would happen." Ben's inspiration, again in Ron's words, “has created a company that finds a way to make it happen. Which has always led to successes that otherwise would have been lost to the big guys." Ben continues to provide his wisdom and guidance to the company and is still heavily involved in the financial side of the business.